With Emirates announcing that it will launch a four times weekly service between Portugal’s second largest city, Porto, and Dubai from 2 July 2019. NOW is the best time to lock Porto into your European Summer Itinerary. This beautiful city is built on the hills surrounding the Douro River; packed with culture to see, a great nightlife, fabulous food and drink. Porto will become Emirates’ second destination in Portugal after its capital, Lisbon. The flight will be operated by a Boeing 777-300ER aircraft in a three class cabin configuration, offering eight private suites in First Class, 42 lie flat seats in Business Class and 310 spacious seats in Economy Class. PORT – It is all in the name “PORTO”, this beautiful sweet after dinner wine was created in the Douro Valley, but it belongs to the city of Porto where the wine ages and is shipped all across the world. Tripas a moda do Porto a famous tripe dish. This dish is said to have originated in the 14th century, when supposedly all meat except for offal was shipped out of Porto to feed Portuguese troops in Africa, leaving Porto’s residents to make the most of tripe. TRIPE NOT YOUR THING? WHAT ABOUT…. Francesinha (meaning Little Frenchie or simply Frenchie in Portuguese) this moorish Portuguese sandwich made with bread, wet-cured ham, fresh sausage like chipolata, steak or roast meat, then covered with melted cheese, a hot thick tomato and beer sauce. SERVED WITH FRENCH FRIES YUMMO! 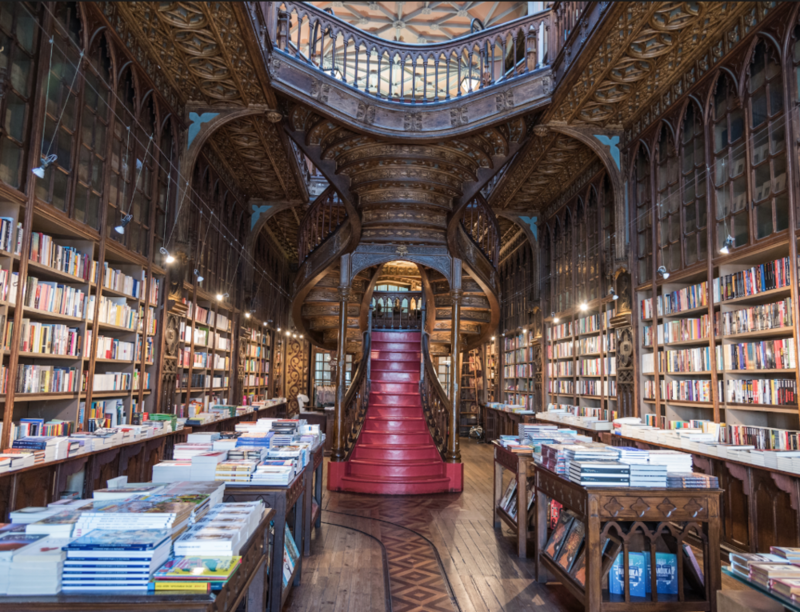 Livraria Lello this book shop is on the MUST VISIT list with travellers visiting Porto just to stop in. Time out magazine says “British newspaper The Guardian and travel website Lonely Planet picked it as the world’s third most beautiful bookstore. Over 100 years old, Lello is a true art-nouveau pearl with neo-Gothic details. Inside, you’ll find the newly restored “Decus in Labore” stained glass and a fabulous red staircase, the store’s defining feature, said to have inspired the one in Hogwarts, from the Harry Potter books (author J.K. Rowling once lived in Porto)”. Clérigos Tower is the tallest bell tower in Portugal. Standing 249 ft (76 metres) tall. Climbing across 49 bells and up 200 steps will be well worth it when you look out from the observation deck at the beautiful city and Douro River.